Some relatively clear examples of effects of metals on populations are the development of resistance to particular metals. Studies have focused on two sites: Foundry Cove (FC) off the main stem HR (color plate 3) with Cd, and Piles Creek, New Jersey, (off the Arthur Kill) with many contaminants, including Hg. 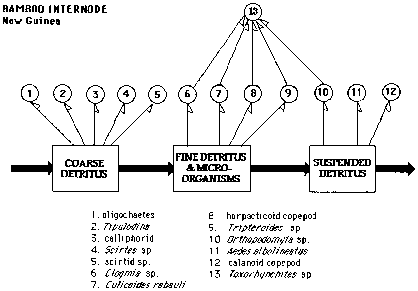 Klerks and Levinton (1989a) found that the oligochaete wormLimnodrilus hoffmeisteri, an abundant species at Cd-Ni contaminated FC, had increased tolerance to Cd (and to combinations of Cd, Ni, and Co) compared to worms from a nearby reference site in South Cove. The resistance was not due to reduced uptake of metal; instead, worms from FC had a higher uptake of Cd from metals-rich sediments than worms from the reference site. Descendants of the FC population that were born and raised in the laboratory also exhibited tolerance, though they were slightly less tolerant than those from FC, indicating that resistance had a largely genetic basis. The authors suggested that resistant individuals have a reduced fitness relative to non-resistant ones in a clean environment. In selection experiments with reference worms, levels of resistance comparable to those observed in FC worms were attained in one to four generations (Klerks and Levinton, 1989b). FC worms had elevated levels of a metallothionein-like metal binding protein, although this was never identified. Metal binding proteins such as metallothioneins are a common mechanism of metal detoxification in plants and animals. Tolerance of high Cd was shown to be genetically determined (Klerks and Bartholomew, 1991) and subsequent genetic analysis indicated that a single gene may be responsible for resistance in the FC population (Martinez and Levinton, 1996). The absence of tolerant worms at the South Cove reference site suggested that there was a cost associated with the Cd-resistance in these worms, and that tolerance would disappear shortly after remediation of FC (which occurred in 1994). Some decrease in resistance was seen in 1997 at some sites, but the distribution indicated an initial mixing of previously resistant and non-resistant populations within FC, rather than costs associated with resistance causing a decline in resistance (Levinton et al., 1999). As of 2002, the resistance of Foundry Cove worms has converged with those at unpolluted sites (Levinton et al., 2003). In addition to the metal-binding protein, FC worms also sequestered a considerable amount of their Cdburdeninmetal-richgranules (MRGs), another widespread detoxification mechanism. Electron microprobe analysis revealed that these granules had equal amounts of Cd and S, suggesting that they may be cadmium sulfide (Klerks and Bartholomew, 1991). The storage of Cd in granules has potential effects on the trophic transfer of metals from the worms to their consumers since MRGs are less easily assimilated than dissolved material (Wallace, Lopez, and Levinton 1998).